This blank white window sticker can be used for a variety of applications. This form has peel-off adhesive strips on all four sides to be adhered to the window on the inside of the vehicle. 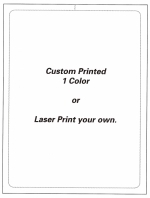 This form is laser compatible and can be printed by you. Form size is 8 1/2in x 11in. Forms are packaged 250 per pack. If you prefer that we preprint any information front or back that you need, see item A8305, below. Note: Adhesive may damage aftermarket inside window tinting. Test all applications before use.